It’s proposal season! For those on the hunt for inexpensive engagement rings, here are a slew of alternatives to walking into a big box store and paying whatever they tell you it costs. An engagement ring is undoubtedly a huge purchase, but there are ways you can save a ton of money so you don’t start your marriage off broke. Inexpensive Engagement Rings? Try free! Student Debt Survivor started a great discussion on engagement rings a while back. In her post, KK asked if it was frugal or tacky to purchase a used ring. While I was among the few who voted tacky, I mostly did so because I was afraid of the bad juju that could come from someone else’s broken dreams. There was nothing rational behind it. The rational argument is that a ring is a ring, whether you buy it from a store at the mall or have it passed down to you from your mom after your parents divorced. If it’s pretty and she’ll like it, there’s no logical reason to not take the free ring. You can use the extra money you didn’t spend on a ring for the wedding or honeymoon, or throw it towards a down payment for a house. 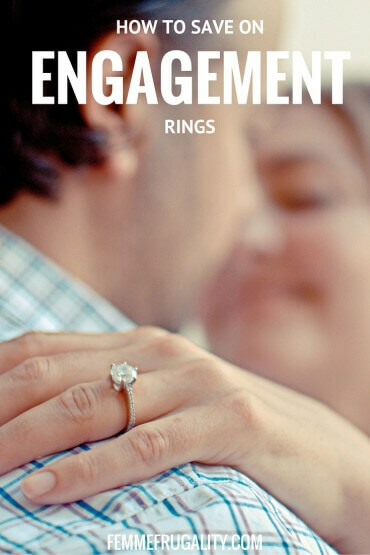 Another way you can save on engagement ring is by buying a cluster ring. Instead of one large diamond in the center, there are several smaller ones. At first glance you wouldn’t necessarily notice, and you can get a lot more bling for your buck. When I was buying my husband’s ring, I came across an awesome savings hack: buy online. When you buy direct from the jeweler, you save an incredible amount of money over the prices in a physical store. I was a little wary when I did this, but it couldn’t have turned out any better. If you pursue this route, there are a couple things you’ll want to take into consideration. The first is that you want to have a good view of the ring. If the site doesn’t provide 3D imaging, you may want to find a site that does. To check out a great example of quality 3D imaging on engagement rings, check out James Allen. If you find yourself on a site that’s providing you with images inferior to theirs, I would stay away. Another thing to stay away from is sites that have tight return policies. You have to order the ring, have it shipped to you, and then actually look at it to make sure you like it and that it’s legit. Tight return policies don’t allow you to do this. Make sure the return policy gives you enough time to go through all of these steps. Look for at least 30 days, and free shipping on returns. My experience buying online couldn’t have been better. Purchasing this way saved me a lot of money, and I hit none of the snags I was fearful of. The ring was legit and beautiful, and arrived in plenty of time for the big day. My last tip for purchasing an inexpensive engagement ring is to buy the two pieces separately; buy the diamond direct from a diamond dealer/wholesaler, and then buy the ring from the jeweler and have them set it. Some cities even have a diamond district, most notably New York City. Using this strategy, you may be better going to a local jeweler than a big box store to have it set, but both should be able to handle it. Some online stores allow you to use this method, too, so you could save even more money by going that route, matching the diamond with the setting while benefiting from the direct-from-jeweler pricing. What are you opinions on the ring matter? How far would you go to save? Or did you splurge? This entry was posted in Ways to Save Money, Wedding on a Budget on January 13, 2016 by femmefrugality. We were lucky to have an heirloom ring from Mr. PoP’s great grandmother available to us. It’s lovely and the sentiment is wonderful, too. I like the term “vintage.” And if it’s a family heirloom I’d be all about it. If the marriage didn’t end in divorce. Haha. I’d love to pass mine down, though. I really wouldn’t want my wedding ring to come from a pawn shop because that doesn’t make me feel very good. I would rather he buy something small that he could afford and potentially upgrade at a future anniversary. Living in LA, we do have a thriving diamond district and that would be a smart option to help lower the cost. I do agree with Mrs. Pop that I would view a vintage ring differently than a ring from a pawn shop or ebay. I hear the same thing about NYC…great diamond district! I’m with both of you on the vintage thing. I generally agree with the sentiments expressed so far. The engagement ring I bought my fiance is admittedly a large expense but then again I did the “frugal” thing and bought the diamond(s) separately from the setting, and had the whole thing custom designed which can actually reduce the cost. I also had the benefit of living in NYC at the time, and there are lots of deals in the diamond district there if you know how to handle yourself. Another tip: look at man-made diamonds or the gorgeous stones made at diamond nexus labs. Thank you for the tips! And kudos on your good buy…her ring is gorgeous! Yeah, I’m kind of with you on this one. I wouldn’t have wanted a used ring either…just carries bad juju for something as important as a wedding/engagement ring. As for everyday jewelry, I’ve got zero issue with it, but … yeah. My engagement ring actually came from Costco and I LOVE it. They have some good quality stuff in their jewelry department if you know what you’re looking for, in a wide variety of prices, and I’d imagine probably cheaper than if you go to an actual jewelry store. I’d never even think to look there! This is a tough one for me. My love of frugality might be trumped by my love of nice jewelry. I am not a fan of “heirloom” rings and wouldn’t want one from his grandma or mother. Nor would I want one from a thrift shop. I know plenty of women who do like rings passed down through generations though! Ultimately, the rings I typically eye cost in the ballpark of $4-6k. However, I wouldn’t want an extravagant purchased made if we have any collective debt. I’ve told Peach (my current bf) if we were to get engaged (many years down the road) I’d just want a simple diamond band no more than $1,500. Once we were debt free and established I could get a nicer ring for an anniversary. I don’t think I would like it if I got an engagement ring from a pawn shop, Ebay, or the site that KK pointed out, but I’m also pretty superstitious. I wouldn’t mind an heirloom, though! But if it were new I’m all for a modest ring since I’d rather get a house or travel rather than worry about scratching up an overly blingy ring (which knowing me, I would do!). Ideally I would want a handmade ring by an artistic independent jeweler, made with recycled metals and a stone that was conflict free (as much as we could tell, I’ve never bought a diamond so I’m not sure how you could even guarantee that and I guess folks could lie). Budget is still important though. I wouldn’t mind a pawn shop especially if we both got our rings from there and we shopped around for the best stones. I didn’t have an engagement ring because my hubby proposed over the phone when he was in Brussels. We just celebrated 25 years on the January 5th. Rings don’t necessarily mean you will have a long partnership. I had a co-worker who bought the engagement ring for his second wife from a pawn shop. He seemed to think he got a good deal.